The Lithe Audio all in one Bathroom Bluetooth Speaker Kit solution comes with an additional IP44 passive speaker enabling the system to be integrated into much large rooms whilst still providing high quality audio reproduction streamed wireless from any Bluetooth enabled device. The system is an all in one unit combining of dual two way speakers, wireless receiver, audio line in and amplifier, in an easy to install in ceiling speaker unit's no larger than the average standard speaker unit. There are two models of this speaker system, a pin protected model number 01588 and an un protected model number 01573 for use with amazon dot. 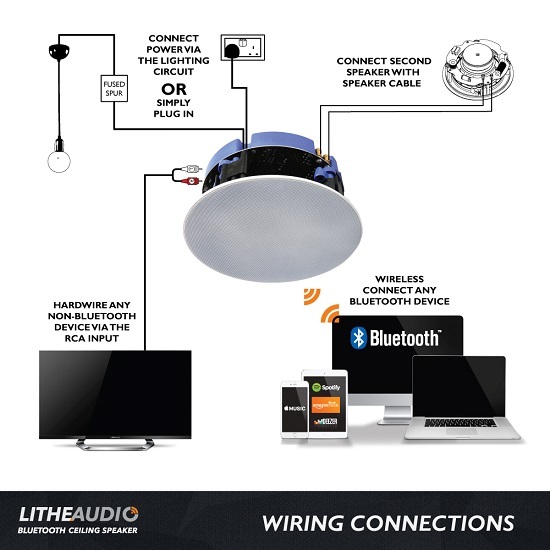 The Bluetooth Bathroom Ceiling Speaker is easy to install and can be connected to power either via the lighting circuit of simply plugged into a standard power socket if preferred. For larger rooms a second speaker can be plugged in and powered from the first speaker this is not normally necessary. A rapid-mount system makes installation easy and fast, and a four-digit PIN code allows for more secure initial setup. 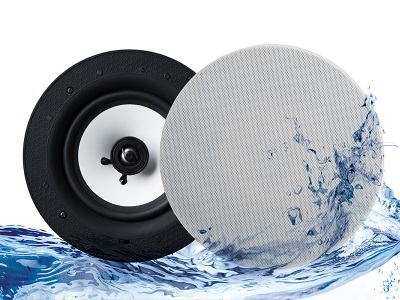 Once connected to a Bluetooth-enabled device, such as a smartphone or tablet, the speaker's integrated device memory will allow instant audio playback for future use. The speaker has a wireless range of up to 10M allowing streaming of your music from your personal library and online service such as Apple, Spotify, Deezer ect.